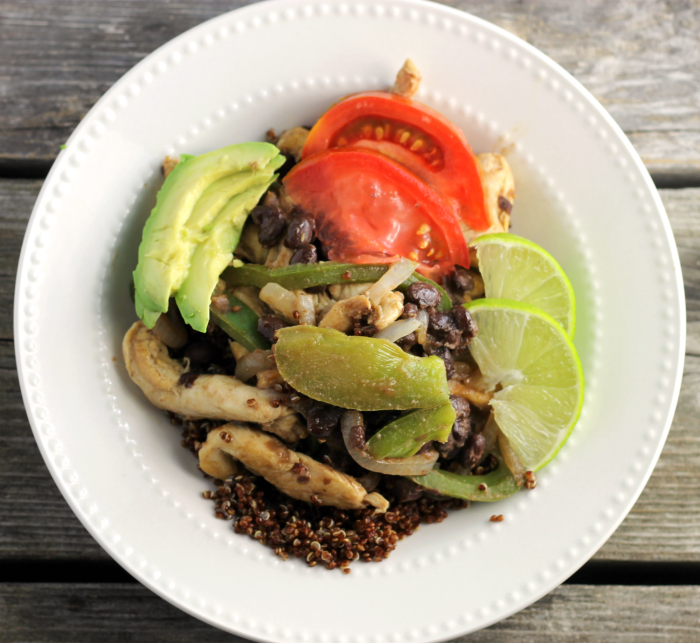 Chicken breast strips, quinoa, black beans, green peppers, and onion come together to make this southwest chicken breast quinoa bowls. I was looking for something healthier for my lunch this week. This is where this southwest chicken breast quinoa bowls come into play. The bowls have great flavor and I like that they are filled with healthy ingredients, on top of all the flavor. It has been an awesome weekend! We had our two grandchildren staying with us for the whole weekend. Aubrey is 4 years old and Riley is 16 months. They are great kids and so much fun to have around, but boy they have so much energy. We went to the park a couple of times during the weekend and I found out that I am way out of shape. They wore Mike and me out running after them, pushing them on the swings, helping them go down the slides, and the list goes on and on. But I loved every minute of it. I really need to eat healthier and exercise more, so hopefully, I am off to a good start with this recipe today. 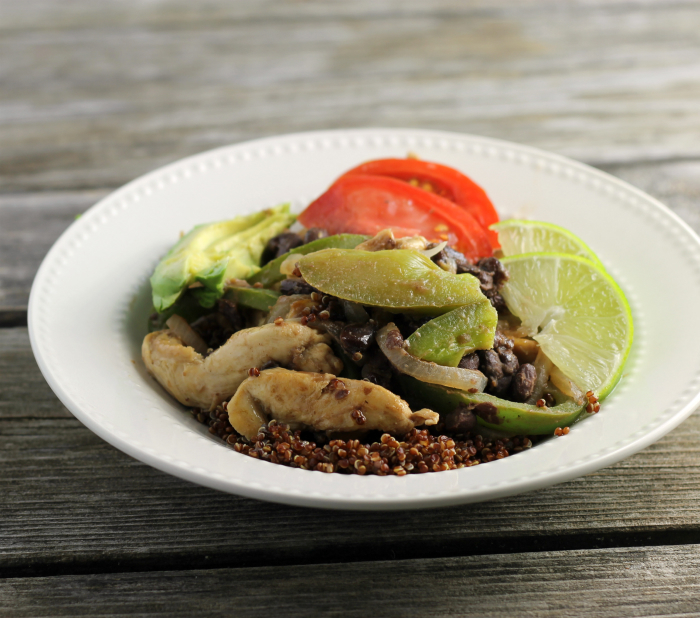 The southwest chicken breast quinoa bowls are filled with healthy ingredients, such as chicken breast, quinoa, black beans, green peppers, and onion. The chicken breast strips are flavored with cumin, garlic powder, salt and pepper. They were simple to make and taste delicious. Looking for a healthier chicken recipe? 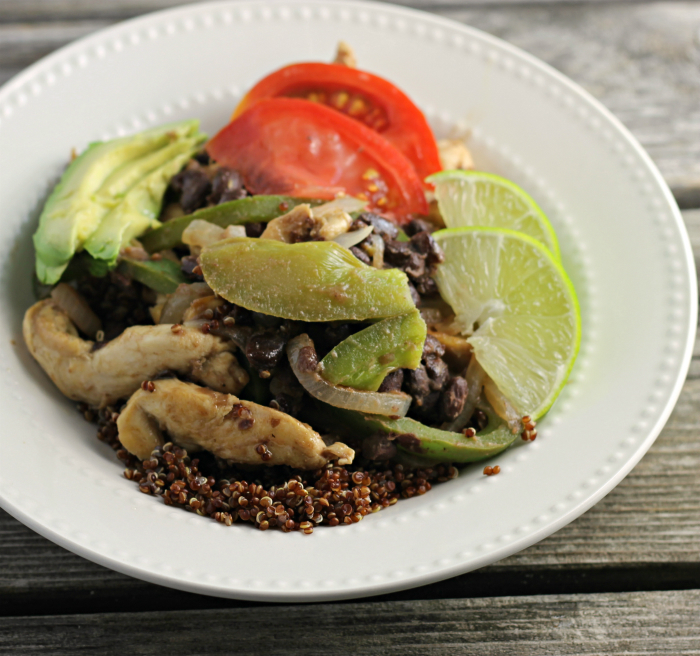 I hope you will try this southwest chicken strips quinoa bowls. In a medium bowl combine the cumin, garlic powder, and onion powder. Place the chicken strips into the seasoning and toss until all is coated. Heat the olive oil in a large skillet over medium heat. Add the chicken and cook until it starts to brown. Add the green peppers and onions. Continue to cook until the chicken is no longer pink inside and the green peppers and onions are tender-crisp. Drain and rinse the black beans. Add the black beans once the chicken and vegetables are done cooking. Heat until the black beans are heated. While the chicken is cooking prepare the quinoa using the directions on the package. Add quinoa to each bowl, top with chicken and vegetables. Add fresh tomatoes and avocados if desired. Black beans, quinoa and chicken…this one is loaded with lean protein…so nutritious and tasty! Sounds like a fun weekend!! And your quinoa bowl looks perfect for breakfast, lunch and/or dinner! So yummy! I love the combination of ingredients. so flavorful and delicious! Nice and healthy bowl…I like all the ingredients in it…it sure makes a great meal.